2020 - Holmes Road interchange and widen to 6 lanes from Stateline Road to Shelby Drive. 2030 - Interchanges at Winchester Road and Stateline Road, widen to 6 lanes from Raines Rd. to Getwell Rd. and from Shelby Dr. to Raines Rd. Due to uncertainties associated with federal funding, TDOT Commissioner Schroer has delayed several projects, including construction of the I-55/Crump Boulevard interchange and ROW acquisition on the Lamar Corridor. Here is a list of the projects delayed from FY 2015 to FY 2106 and a letter from Schroer to the Tennessee General Assembly explaining his decision. It looks like projects in Tennessee will continue to be delayed until the U.S. Congress enacts the next multi-year reauthorization. The city of Memphis has agreed to shift $2.7 million that had been set aside for a proposed interchange renovation at Perkins and Winchester to the Lamar project. The money will go toward the purchase of right of way for the first phase of improvements, extending from the Mississippi state line to near Shelby Drive. The reallocation of the funds was endorsed this month by a committee of the Memphis Metropolitan Planning Organization. The Tennessee Department of Transportation, facing long-term funding shortages for highway improvements across the state, had asked local governments to contribute money for right of way acquisitions for “large-scale, regionally significant projects,” said Kate Horton, transportation planner with MPO. The new money for Lamar allows officials to “move that project along” and start buying land in fiscal 2016, she said. TDOT late last year announced delays for Lamar and more than 30 other projects, citing shortfalls in federal support for highway work. City Engineer John Cameron said the project to redo the Perkins-Winchester interchange will be pushed back to 2017. The funding shift reflects the high priority assigned to the Lamar project. A critical route serving Memphis’ warehouse and distribution operations, including BNSF Railway’s sprawling intermodal facility, Lamar is clogged almost daily with trucks that back up at the numerous traffic signals. During 2013, an average of nearly 37,000 vehicles a day traveled the route, according to TDOT figures. The improvement project aims to reduce that congestion by replacing several signals with grade-separated interchanges between Getwell and the Mississippi line. But because the property along the corridor is heavily developed, the projected cost of acquiring right of way ($165.2 million) far exceeds the anticipated bill for construction ($88.1 million). Officials haven’t released a timetable for completion of the overall improvement work. “It’s a huge project,” Cameron said. Improving Lamar long has been a top goal of the Greater Memphis Chamber. Will these improvements allow Interstate 22 to be extended into Tennessee? As I understand it, TDOT has elected to build selected interchanges and widen Lamar to six lanes, with several at-grades remaining. That said, this post discusses how, in 2012, Commissioner Schroer spoke of the cost of the Lamar Corridor upgrade in terms that fit a full-interstate upgrade. I suppose it is possible that TDOT has chosen an interim solution that would allow for a later upgrade to an interstate, but I do not believe that an interstate upgrade would be likely in either the near term or the mid term, and that an interstate upgrade in the long term would be a remote possibility (which is a primary reason why I started this thread instead of continuing to post Lamar developments in the Interstate 22 thread). According to state estimates, the Lamar Avenue project – though currently unfunded – will cost $262.5 million. Once completed, it will improve safety and reduce traffic congestion on one of western Tennessee’s biggest commuter and freight corridors. After hearing Memphis officials emphasize the importance of fixing the chronically congested Lamar Avenue corridor, U.S. Transportation Secretary Anthony Foxx spoke sympathetically Tuesday but offered no immediate help with the $253 million project. Foxx commented after local leaders spoke of the need for improvements along Lamar, also known as U.S. 78, particularly the congested stretch from Getwell south to the Mississippi state line. Served by logistics companies with annual sales totaling $4 billion, the route is clogged daily with trucks backed up at the numerous traffic signals along the route. “While it’s the busiest corridor in the South-Southeast, it’s one that’s causing a lot of damage now,” said Chamber chief executive Phil Trenary. The project to enhance the corridor includes construction of grade-separated interchanges to replace the signaled intersections. But the enhancement plan is so costly — and funding so scarce — that the City of Memphis recently agreed to shuffle $2.7 million from a another project to pay for initial right of way acquisitions for the Lamar work. Without the improvements, companies might decide to relocate, Trenary said. Maybe it does make sense to end I-22 at I-269 instead of letting it peter out before crossing the state line. Then after the improvements are done, it's a wait-and-see situation. I find it curious that they improvements end at Getwell Road. It might be since the six lane portion of Lamar Avenue ends there. It may be a little easier to route a freeway along Getwell from there to I-240 instead of continuing along Lamar Avenue. The big issue with that, however, is the neighborhood that it runs through. While the ROW would probably be cheaper, it would probably face a lot of opposition. I find it curious that the improvements end at Getwell Road. It might be since the six lane portion of Lamar Avenue ends there. With these eye-popping figures, it could be a while before the improvements actually come, if at all. I'd be for making it an expressway with RIRO access at the side roads. It's not that easy, Henry. Except in the vicinity of the Raines Rd/Perkins Rd interchange, there's no access control along Lamar. Which means that adjacent businesses and property owners have direct driveway access onto Lamar Ave. This is in no small part why the ROW costs are so high. Even doing what you suggest would carry a high price tag as it would still require dealing with the driveway access. One possible option would be to do a jersey barrier along the median, do RIRO, and then have some form of U-turns at the major intersections or interchanges, like US 1 between Trenton and Woodbridge. Of course, that isn't easy either, but it would be a cheaper solution than making the whole thing a freeway. With these eye-popping figures, it could be a while before the improvements actually come, if at all. Raising the gas tax is just one of the solutions state leaders are considering to close a staggering gap between transportation needs in Tennessee and available funding. “The state has about $6 billion worth of backlog projects,” Haslam said. In Haslam’s travels throughout the state, he has been holding meetings with the Tennessee Department of Transportation and local leaders about transportation funding. Although he is about halfway through those meetings, Haslam is no closer to taking a stance on a solution. One project Haslam has been focusing on is Lamar Avenue. He said the cost of fixing it is around $270 million. His transportation meetings will continue across the state through next month. The Governor's focus on the improvements may result in at least some of them occurring in the relatively near future. Joined by Department of Transportation (TDOT) Commissioner John Schroer, Haslam also released two transportation projects lists: a list of 181 backlogged projects that will not be completed or at least under contract until 2034; and a list of 765 new project needs that cannot be considered until 2022 at the earliest, if ever. Gov. Bill Haslam said in Memphis on Monday that it was time to put together a new "road plan" in Tennessee and said he hoped the General Assembly would tackle that plan — and how to pay for it — before he leaves office in 2018. "We think it has to be discussed," Haslam said when asked if he wanted the legislature to take up a plan next year. "I guess I'd say it this way: I think it needs to happen while I'm governor, because if it doesn't, the new governor's not necessarily going to want to take that up in their first two years. There is no way we can keep going the way we are for the next five years. There's just no way it will work. People will feel that. And I think we need to address it while I'm in." Haslam toured the state Monday, as he did this summer, highlighting the state's infrastructure backlog. He said 181 backlogged projects in 62 of the state's 95 counties won't be completed until 2034 unless the state tackles the issue. Haslam stopped short of proposing a gas tax increase — or any funding solution — Monday. But he did push what has become a frequent bullet point of his on the topic, that increased fuel economy has led to Tennessee's per-gallon tax not being worth what it used to be. "There's no other tax you can say it's half what it was 20 years ago," Haslam said. Haslam's Memphis event — carefully staged so attendees and reporters would see and hear traffic on Lamar as he spoke — was his fourth on a five-city crisscrossing of the state that included similar events in Alcoa, Kingsport, Chattanooga and Lebanon. Guessing that "new" project is a bridge replacement at the 240/Lamar interchange. Just curious, are these projects bringing Lamar Avenue up to Interstate standards? No. They're basically to widen Lamar to 6 lanes (3 each way) where it's currently 4. From earlier studies, conversion to Interstate standards would be about 3-4 times more expensive (not to mention require a boatload of right-of-way) than what's shown. Hence the ending of I-22 at I-269. Interesting that the ROW costs are going to be more than the construction costs as proposed right now. Because the inadequacy of Lamar Avenue is a separate issue from the routing of I-22. Lots of commercial interests that could be affected. I think the Lamar Avenue improvements will be a top priority if and when a funding increase is enacted. While Shelby’s backlogged projects are all over the map, transportation and logistics industry experts listed Lamar’s $229 million fix as the No. 1 thing that would help move freight through and within Memphis. Dan Pallme, senior associate director of the Intermodal Freight Transportation Institute at University of Memphis, said Lamar’s service level suffers because of competing demands of passenger vehicles and trucks, but the solution is so costly that it’s slow in coming. “Obviously the Lamar corridor is primarily F-rated at a majority of times people try to travel. TDOT has a plan. It’s in the long-range vision. The problem is it costs a huge amount of money. (But) the longer we wait, the harder it is for Memphis to get caught up, so to speak,” Pallme said. Tennessee’s $11.4 billion in transportation needs won’t be done for 51 years, assuming 2 percent inflation and nothing new is added to what the Department of Transportation (TDOT) already has on its plate, a TDOT deputy commissioner said Thursday. Toks Omishakin told an annual State of Freight conference at University of Memphis that improvements to the Lamar Avenue corridor in Memphis and other projects will move agonizingly slow until Congress and the state come up with a sustainable solution to funding transportation infrastructure. The TDOT official joined transportation, logistics and planning experts for the Intermodal Freight Transportation Institute’s ninth annual Intermodal Conference. TDOT has a $6.1 billion backlog of projects already authorized by legislators and $5.3 billion in new projects identified. 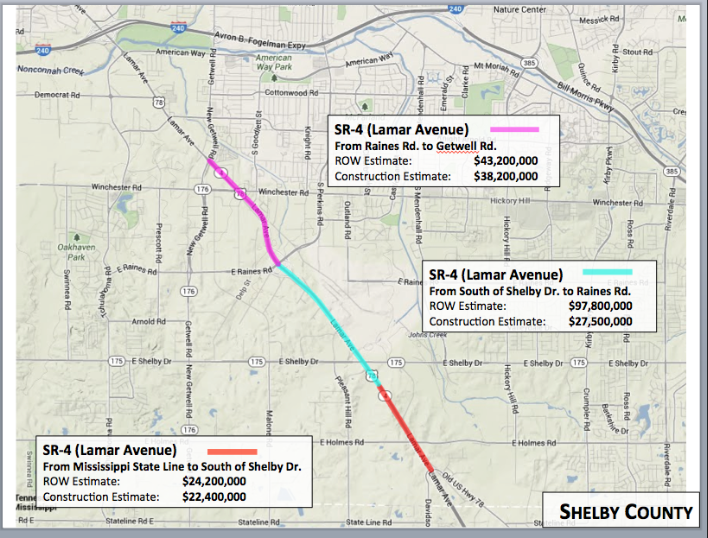 Lamar Avenue, a major artery for freight and passenger traffic, is among nearly a billion dollars in pending projects in Shelby County, Omishakin said. Omishakin said the biggest win in Congress’s action last week was a freight program that will spend $2 billion to $2.5 billion a year on projects to improve movement of products. However, Congress skirted the issue of making highway users pay more into the system, he said.